Pan Pacific Manila, the top luxury hotel in Manila, recently rolled-out it latest culinary offerings featuring Middle Eastern dishes prepared by Pan Pacific Manila's new sous chef, Chef Tarek Alsarraj. Chef Tarek, who is from Syria, brings with him his mastery of various Middle Eastern cuisines to conceptualize and create dishes for the hotel's Middle Eastern guests and clients. According to my Middle Eastern colleagues at the office, the best Middle Eastern chefs are usually from Syria, so I am confident that Chef Tarek will impress not only the hotel's Middle Eastern guests, but the hotel's Filipino and other foreign guests as well. Majority of the ingredients and spices were imported from the Middle East except for the fresh ingredients such as vegetables and meats. This is to ensure that the taste of the dishes are closest to authentic as possible. Chef Tarek also has a separate kitchen, separate cooking utensils and separate food storage to ensure that his ingredients don't get in contact with Haram (non-Halal) ingredients. Here are some of the Middle Eastern dishes we sampled. For starters we had the Hummus and Mutabbal served with pita bread. I love Hummus and Chef Tarek's version was very thick and fine in texture, and very rich in chickpea flavor. The Mutabbal has a lightly smokey taste with a well balanced sweetness, saltiness and bitterness. We then tried two types of Sambusa. Beef Sambusa has a lightly savory beef filling while the Veggie Sambusa has a mixture of mashed potato and other spiced vegetables. Sambusa are then fried before being served. Both Edgar and I prefer the beef version. I wonder how a Chicken Sambusa would taste. Chef Tarek also served the Arabic Mixed Grill, consisting of lamb rack, beef kofta, lamb kofta, chicken shish tawouk, shrimps and grilled vegetables. Everything was perfectly grilled. The chicken, beef and lamb were tender, moist and flavorful. But the bestseller were the shrimps! Two other main dishes were served. The Samak Harra is a spicy fish dish made of snapper or grouper fish cooked in tomato sauce and seasoned with with bell peppers and various Arabic spices. The Chicken Kabsa (see top photo) had chicken cooked in tomato sauce and seasoned with bell peppers and various Arabic spices, and served on a bed of Basmati rice with cashew and cherry tomatoes. This was my favorite because the chicken was flavorful, tender and moist. The rice was perfectly flavored to match the chicken. 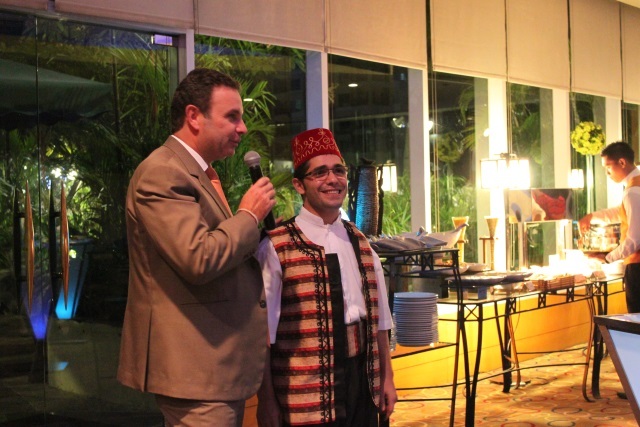 Finally, for desserts, Chef Tarek served two types of pudding, the Umm Ali and the Turkish Pudding. But our favorites were the Tulumba, which is similar to churros but is crunchier and has a distinct Middle Eastern flavor; while Chef Tarek's Baklava has got to be the best one we've ever tasted! If this is how an authentic Baklava should taste, then I won't eat Baklava anywhere else but at Pan Pacific! We then finished off our dinner with Turkish Coffee and Moroccan Tea. I always thought that Turkish Coffee and Greek Coffee are the same, but having finally tasted an authentic Turkish Coffee, proved me very wrong. Turkish coffee has a very distinct aromatic flavor. After dinner, we also got to try Shisha. For only P500.00 nett per flavor, you can already have a shisha session with your friends which also comes with one serving of appetizer from the Middle Eastern menu. It was our first time to experience Shisha and so far it has been an enjoyable social experience. With a very talented in-house sous chef responsible for Middle Eastern cuisine and with the addition of Shisha sessions as one of its offerings to its guests, Pan Pacific Manila further sets itself apart from other hotels in the Manila Bay Area as it strive to continuously provide refreshing experiences to its guests. With Ms. Jane Perez joining the management team as the new Sales and Marketing Director of Pan Pacific Manila, we are confident that Pan Pacific Manila will continue to surprise us with new concepts in the future.